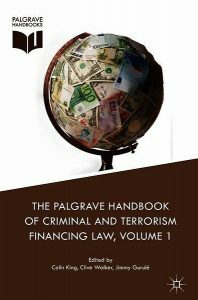 The Palgrave Handbook of Criminal and Terrorism Financing Law focuses on how criminal and terrorist assets pose significant and unrelenting threats to the integrity, security, and stability of contemporary societies. In response to the funds generated by or for organised crime and transnational terrorism, strategies have been elaborated at national, regional, and international levels for laws, organisations and procedures, and economic systems. Reflecting on these strands, this handbook brings together leading experts from different jurisdictions across Europe, America, Asia, and Africa and from different disciplines, including law, criminology, political science, international studies, and business. The authors examine the institutional and legal responses, set within the context of both policy and practice, with a view to critiquing these actions on the grounds of effective delivery and compliance with legality and rights. In addition, the book draws upon the experiences of the many senior practitioners and policy-makers who participated in the research project which was funded by a major Arts and Humanities Research Council grant. This comprehensive collection is a must-read for academics and practitioners alike with an interest in money laundering, terrorism financing, security, and international relations.